Joe Jusko is undoubtedly one of the best known Fantasy, Pin-Up and Comic Artists in the world today. His career has spanned over 30 years, starting with the sale of his very first cover for Heavy Metal Magazine in 1977 at the age of 17. Since graduating that year from NYC’s High School of Art & Design, Joe has worked for almost every major comic book publisher: DC Comics, Crusade Comics, Innovation Comics, Harris Comics, Wildstorm Comics, Top Cow Productions and Byron Preiss Visuals, to name just a few, producing hundreds of images for both covers and interiors. 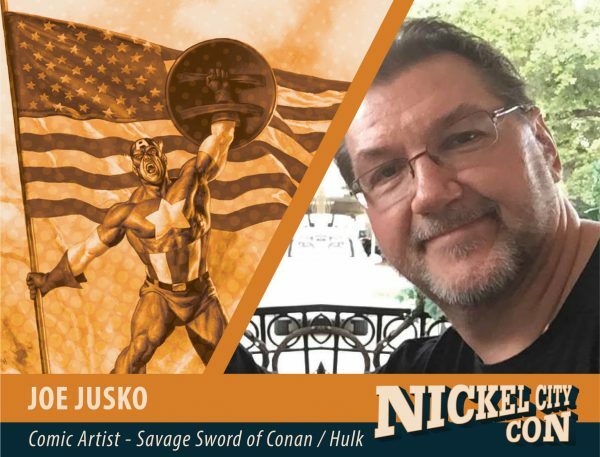 His work has appeared on paperback book covers, calendars, posters, t-shirts, toy packaging and innumerable trading cards, most memorably the multi award winning 1992 Marvel Masterpieces Trading Cards. The popularity of that set has been credited with initiating the painted trading card boom of the 1990’s, and led to his groundbreaking 1995 Art of Edgar Rice Burroughs trading cards. Those 125 paintings have made him the most prolific Burroughs artist ever, producing art based on almost every major book by the famed author.